Can an old piano be repaired? Should I buy a piano from Gumtree or Ebay? How much does a secondhand piano cost? How much does a new piano cost? I want to find out if you would be interested in buying my piano. What should I do? My piano has broken strings, sticky keys or keys not working. Can this be repaired in our home? How much does freight cost to send my piano to you for restoration and do I need to organise it? How long will it take to restore my piano? Generally, a piano should be tuned every 12 to 18 months. If the piano is being played daily or for extended periods, then more frequent tuning may be required. However, even if the piano is not played regularly, we still recommend that the tuning be left no longer than 2 years. The reason for this is that in most cases, weather variations and differences in humidity can affect the tuning stability of the piano. With Australia’s widely fluctuating temperatures, the tuning can drop even if the piano is not being regularly played. 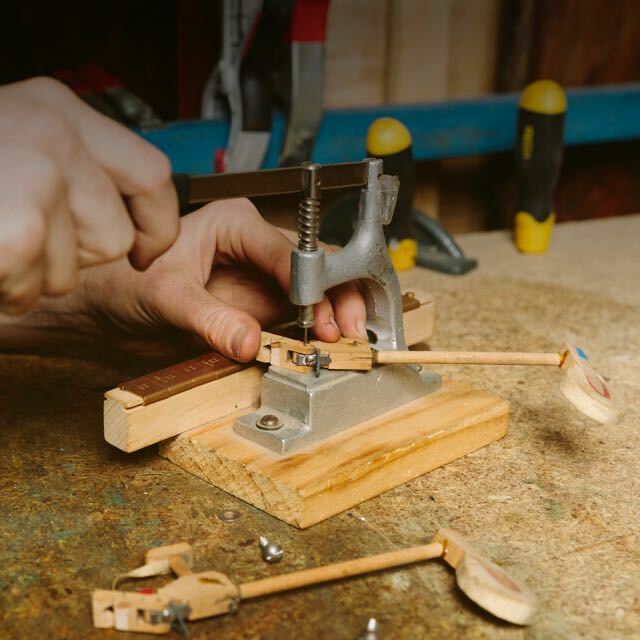 If a piano is left for many years without being tuned, the pitch will eventually drop to a point where it either cannot be tuned or needs several tunings to correct. Most piano tuners say ‘No’, we say ‘Absolutely Yes’! And we have the skills and experience to fix it! Unlike new pianos with mostly plastic components that clip together, older style pianos are made almost entirely from wooden components that are screwed into place. This is a distinct advantage for 2 reasons. Firstly, if a piece breaks, we can physically remove it, glue it together, screw it together or make another part from scratch. Secondly, we have amassed a stockpile of over 10,000 spare parts in our piano restoration workshop, having spent years’ dissembling old pianos. To our knowledge, we have more parts than any other piano restoration workshop in Australia. In Australia’s harsh summer weather, plastic components in new pianos often becomes brittle and simply break over time. Older style pianos don’t have this issue. b) beat everyone else to it! Part of our business is moving pianos for customers and often, we are moving pianos that customers have purchased through Gumtree or Ebay. We see a lot of pianos in poor condition where people have overpaid, then paid for transport, then paid for tuning and still have a piano that isn’t that great. If you are thinking of buying a piano privately, please call us first. We would rather offer you some free advice over the phone than turn up on the day to move or tune a potentially faulty piano. We sell a range of refurbished pianos that come with a warranty, delivery, tuning and stool. Check them out here. It is a little hard to give an exact estimate as to how much a piano restoration will cost because each restoration job is unique. Aside from our own stock, we restore approximately 15-25 pianos each year for customers across Australia. If a piano requires interior restoration only, then a typical job falls between $1,250 – $2,500. Pianos requiring an exterior restoration, such as French polishing the woodwork, in addition to the interior restoration will usually fall between $3,000 – $5,000. Pianos that need a total restoration including interior, exterior and structural including re-stringing, will generally be upwards of $5,000. Our secondhand pianos generally range from $1,295 – $4,995 and come with free delivery, tuning, stool and written warranty. Privately, the cost of secondhand pianos varies greatly from a few hundred dollars to several thousand dollars. In addition, you generally need to allow another $500 to transport, tune and service the piano. Beware of cheap pianos if buying privately. It’s the old saying – you get what you pay for! We sell a range of refurbished pianos that come with a warranty, delivery, tuning and a stool. Check them out here. Our range of new pianos start from $4,495 and include deliver, a stool and post-delivery tuning. Most piano retailers advertise new pianos with a starting price around $4,000. However, there are often additional dealer delivery fees, home delivery fees and tuning costs. We have sold new ‘Alex.Steinbach’ and brand upright and grand pianos for more than 20 years. We will give you a quote for any size or style piano you want and that quote will not change, there will be no more surprise costs. Check out our range of new pianos here. If you wish to make an enquiry about selling your piano to us, please text or email some photos of your piano, together with your asking price and your contact details. This will help us to better respond to your enquiry. We like to receive at least one photo of the whole exterior of the piano, a photo looking at the front and keyboard and one looking at the inside playing mechanism from the top. We come from a technical and mechanical background, we are piano tuners, technicians and restorers, not salesmen. Our family business has been tuning, servicing and maintaining Alex.Steinbach pianos for over 20 years. We know these instruments inside-out and back to front. In 2007, we were approached by Alex Steinbach and awarded South Australia’s sole licence to sell their range of upright and grand pianos. When you purchase a piano from most retail piano shops, you will deal with a salesman, a delivery company and a tuner. We are different! When you purchase a piano from us, we will deal with you from start to finish. We can show you a demonstrator piano, place the order for you and complete all the paperwork on your behalf, personally deliver the piano to your home and complete the in-home installation and tuning. After the purchase, we can take care of your piano’s ongoing tuning and maintenance needs. Repair of up to five sticking notes or broken strings is included in one of our tuning and Adjustment services and is generally able to be done in the home. If additional work is required, we can generally remove the action (playing mechanism) of the piano and take it to our workshop for repair. Removal of the entire piano is not often required. Leaver & Son offers a professional and insured freight service for transport of pianos to and from our workshop for restoration. Freight costs will generally range from $100-$200 each way. The length of time needed to restore a piano will depend on the work required and the availability of parts and materials. Generally a piano restoration can take between 2 weeks to 3 months to complete. We will keep you updated throughout the process.